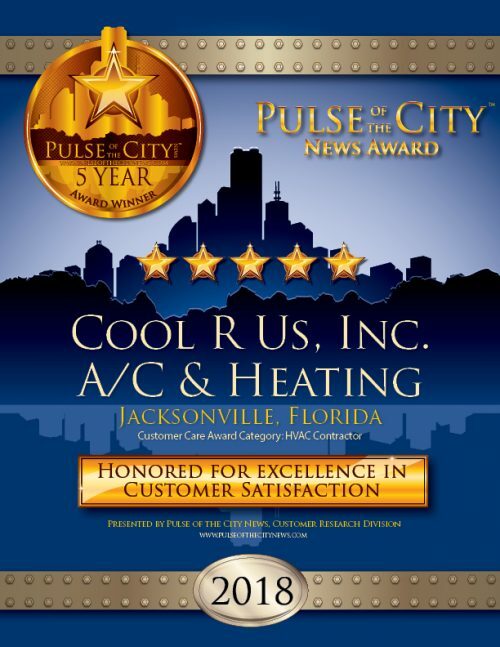 Jacksonville, Fla. (Sept. 25, 2018): Cool R Us, Inc. A/C & Heating has once again been recognized by Pulse of the City News for providing more than just the best products at fair prices in the HVAC industry. The company just received its fifth consecutive Pulse Award for Outstanding Customer Satisfaction. 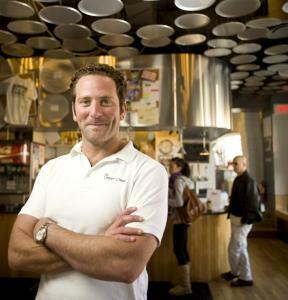 In 2007, Lek Gjoka realized his American dream when he opened Cool R Us, Inc. A/C & Heating. Since then, the company has doubled its business annually and earned a reputation for providing high-quality HVAC services to Jacksonville and the surrounding areas. The company’s knowledgeable specialists handle comprehensive home comfort services such as air conditioning repair and maintenance, furnace and heating repair, indoor air quality control solutions, HVAC system layout and design, installation of new or replacement HVAC systems, and duct cleaning. The goal is to provide the best possible services at the most affordable price. 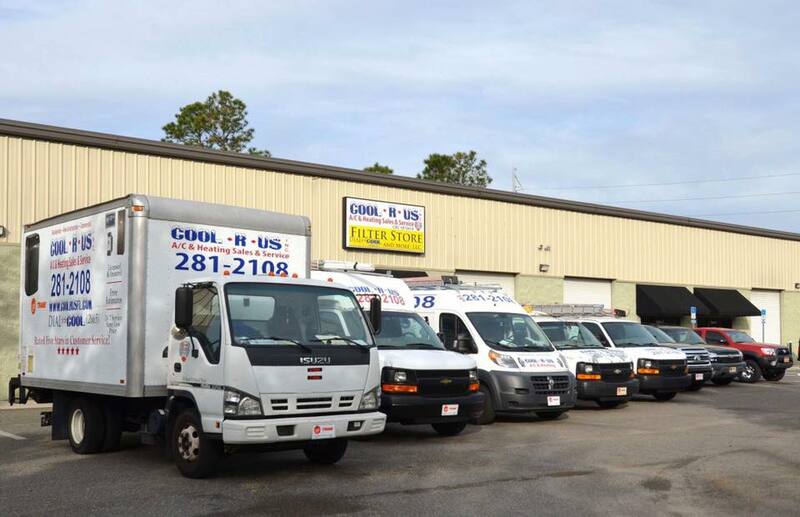 At every step, the team at Cool R Us, Inc. believes in going above and beyond to meet customers’ needs. To accomplish that, the company employees are always polite and friendly, professionally attired, on time, respectful of customers’ time and property, and committed to following up to ensure complete satisfaction. What sets the Pulse Award apart is the research behind it. Pulse uses a database of performance information that has been compiled on an ongoing basis since 2009. Then, by determining an annual rating for companies, Pulse offers a level of stability that tells the whole story, not just what the company did last week. The Pulse Award is reserved for those earning the highest ratings of 4 or 5 stars. Cool R Us, Inc. is located at 6000 Philips Hwy. #3 in Jacksonville. For more information, call 904-222-6603 or go online to www.coolrusnfl.com. Visit the company’s Award Page at https://www.pulseofthecitynews.com/company-details/34x2z234x243/COOL-R-US-INC/JACKSONVILLE/FL. The leaders behind Pulse of the City News and The Stirling Center have a lifetime of experience in the real estate, building and construction fields in news and publishing. Pulse of the City News, rooted in the building and construction industry, has teamed with The Stirling Center to bring the benefits of the “customer experience” perspective to the industry. The two firms are dedicated to recognizing building and construction companies and individuals that successfully embrace the combination of quality product and exemplary customer service, and providing services to them and others aspiring to embrace both objectives. The Stirling Center provides “customer-first” learning resources, including articles, courses, and training tools and materials on customer-oriented performance. Pulse of the City News and The Stirling Center are located in Lapeer, Michigan. For more information, call 866-732-9500 or go online to www.pulseofthecitynews.com.